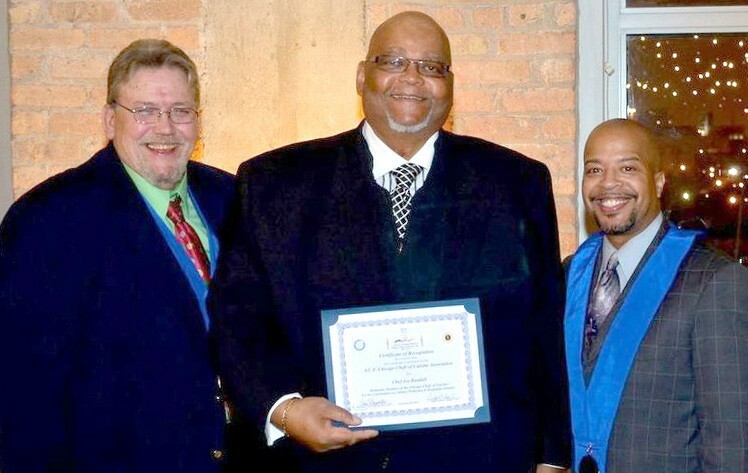 (L-R) Chef Chas Boydston, President of the Chicago Chefs of Cuisine; Chef Joe Randall of Chef Joe Randall’s Cooking School of Savannah and Chef Dwight Evans, Vice President of the Chicago Chefs of Cuisine and Chef of the Year for 2013. At Chef Joe Randall’s Cooking School, for more than 13 years, he has shared his passion for southern food and culture with the Savannah metropolitan region and beyond. He preaches the gospel of authentic southern cuisine to all comers. The success of the school is a credit to Chef Joe’s great love of southern cuisine, the city of Savannah and his efforts to share the historically accurate heritage of southern culture with visitors from all over the world. Chef Joe Randall is the owner of a nationally acclaimed cooking school in Savannah, Ga. He is a 50 year veteran of the hospitality and food service industry. The depth and range of his experience and his dedication to professional excellence, has earned him the respect of professional chefs as well as restaurant managers and owners.